They were able to distinguish three principal categories, reflecting the adaptive capacities of cells. Knowledge of this “origins code” should make it possible to determine any alterations in the event of cancer, or even to develop new tools for gene therapy. These findings, which mainly result from a collaboration between molecular biologists at the Institut de Génétique Humaine (CNRS) and bioinformatics specialists in the Laboratoire Technologie Avancée pour le Génome et la Clinique (TAGC, Inserm/Aix-Marseille Université), are published on 11 November 2015 in Genome Research. Replication occurs in the nucleus of a cell (left) and can be observed at numerous sites by the presence of foci detected by the incorporation of fluorescent nucleotides (red dots). Within each focus, replication starts from the replication origins and spreads to the right and left of DNA fibers. On the right, two fluorescent nucleotides (green and red) are added one after the other and show the progression of replication. Deciphering the origins code : to initiate its replication, DNA (represented here by a zip) opens up at several sites called replication origins, which exceed 50,000 in the DNA of each cell. 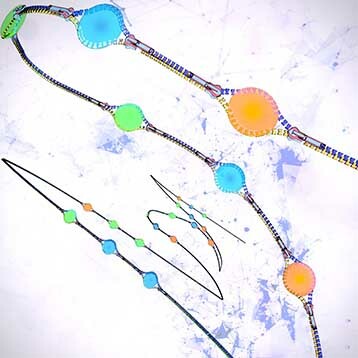 These sites are defined by three different code types (featured here in blue, orange and green) that have been deciphered in this study. During replication, each strand of the zip recreates a full zip. The DNA of each cell is thus replicated and shared between two daughter cells. The chromatin environment shapes replication origin organization and defines origin classes, Christelle Cayrou, Benoit Ballester, Isabelle Peiffer, Romain Fenouil, Philippe Coulombe, Jean-Christophe Andrau, Jacques van Helden & Marcel Méchali. Genome Research, 11 November 2015.